You don’t have to wait for Christmas to enjoy a Paleo shortbread cookie and we aren’t here to judge whether you have been naughty or nice – we just want to share a mouthwatering dessert worthy of your undivided attention. It makes us peckish, just thinking about whipping up a small batch, so it is probably a good thing this shortbread recipe only serves 4! While we all know that it isn’t good to go overboard with Paleo desserts, this one is different. Choose the right kind of dark Paleo chocolate and these cookies will leave you completely satisfied, thanks to the generous amount of ghee and almond flour. If experimenting in the kitchen is your thing, and you are ready for a little Mexican kick, why not add a hint of cayenne pepper and cinnamon to the melted chocolate before drizzling? 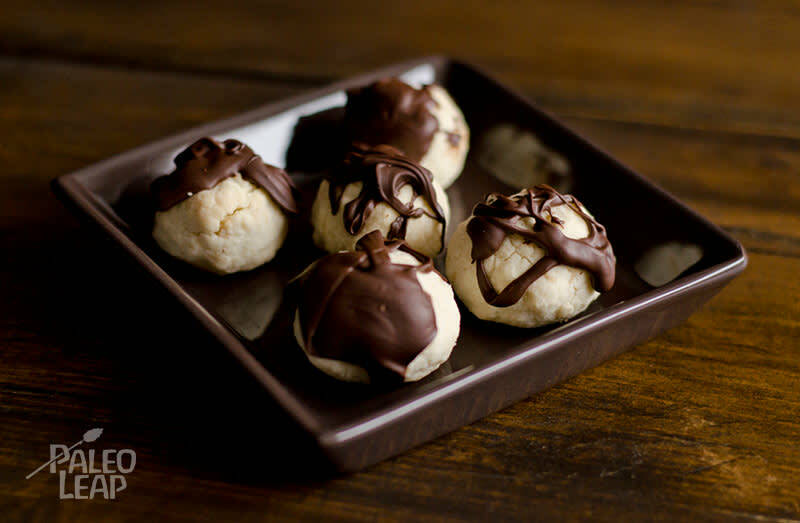 You might even try them with a Paleo white chocolate drizzle – or better yet, let streams of dark and white chocolate trickle all over the cookies in thick and thin lines. Make it a piece of art and devour every morsel. As Paleo desserts go, this may be served/reserved for a special occasion, however, it works equally well for a pick-me-up at the end of a difficult week. It’s a cookie for the times when you think: “just because”. Just because you want, just because you need… Just because we said that you are allowed to have two – one for each hand. In a small saucepan over low heat, melt the ghee, coconut oil and honey. In a medium bowl, measure out the almond flour. Slowly pour the ghee mixture into the almond flour, stirring constantly. Roll the dough into 1 1/2” balls and place on a well greased baking dish. Bake for 15 to 20 minutes, or until golden in color. Allow the cookies to cool for several minutes. Once cool, drizzle with melted chocolate.